Have you heard the one about the high-ranking Republican official who got into hot water for failing to file his state income-tax returns? Sorry, but this is no joke. 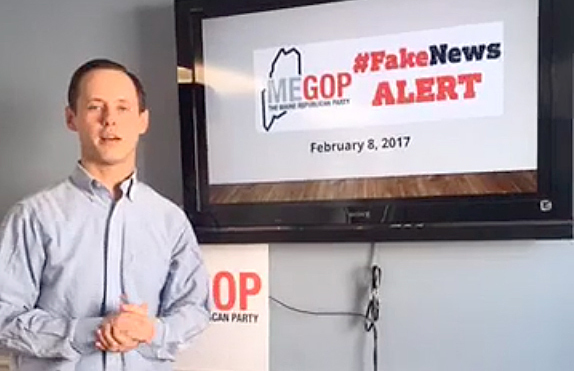 The official is Jason Savage, executive director of the Maine Republican Party. Public records on file in Penobscot County show that he failed to file state income tax returns in 2013 and 2014 – his first two years as the party’s chief executive. He was commenting specifically on a pair of tax liens, placed against him by Maine Revenue Services, currently on file with the Penobscot County Registry of Deeds. One labels Savage a “non-filer” of his state income tax return for 2013, the same year he ascended from the pro-Gov. Paul LePage group People Before Politics to chief executive of the Maine Republican Party. That claim, including back taxes, penalties and interest, totals $5,985.62. It was recorded with the registry last August. The other, totaling $5,376.08 for 2014, also indicates a failure by Savage to file a state return. It was recorded in the book of deeds last October. They are but two of 16 liens recorded against Savage since 1999 in Penobscot County, where he currently lives in the town of Enfield. Eleven of the liens, all but one of which were paid and subsequently discharged, involved unpaid sewer bills and property taxes in the towns of Howland and Enfield. The other five came from Maine Revenue Services. Three of those, for the tax years 2004, 2007 and 2012, ranged from $528 to $796. All three have since been released. Not so for the 2013 and 2014 liens, both of which remain in force against “all real property, fixtures and crops that are presently owned or hereafter acquired by this taxpayer.” Together, they total $11,361.70. This bombshell comes at a particularly bad time for Savage, who in recent days has faced widespread criticism after his digital fingerprints were discovered in the metadata behind the anonymous right-wing website Maine Examiner. Last week, the Maine Democratic Party filed a complaint against the site with the Maine Commission on Governmental Ethics and Election Practices. The Democrats requested an investigation of the website’s involvement in election politics without the required disclosure of its authors and funding sources, as well as a look at Savage’s apparent involvement with its creation and content. On Monday, after reading my Sunday column about that ongoing debacle, a reader who wished to remain anonymous alerted me by email to the various liens against Savage in Penobscot County. Savage, to be fair, is hardly the only Mainer to get into this kind of mess. According to David Heidrich, spokesman for Maine Revenue Services, some 7,500 such liens go out each year, representing less than 1 percent of all Maine filers. The issuance of a lien, Heidrich explained in an email, is the final step in a lengthy collection process that begins with a request to file a return, followed by a demand to file a return, followed by an assessment of tax liability based on “the best information available” to Maine Revenue Services, followed by a demand to pay, followed by a lien warning. At a minimum, those steps take just under nine months. If the tax bill totals between $1,500 and $10,000 and still isn’t paid 30 days after the warning, Heidrich said, the lien is filed with the appropriate registry of deeds. Even then, however, Maine Revenue Services does not foreclose on properties for non-payment of state taxes, Heidrich noted. Savage responded immediately to a request for comment early Tuesday, although he repeatedly voiced his reluctance to go into detail publicly about what got him into financial hot water with the state. What will linger far beyond his final payment, however, is the crushing irony that hangs not only over Savage, but also over the party he oversees. Throughout his five-year, full-time tenure as executive director, and before that as a trusted adviser to LePage – for whom he previously worked at Marden’s Surplus & Salvage – Savage has been at the center of a transformation in the Maine Republican Party. It’s a party whose platform now calls for eliminating, of all things, the state income tax. It’s a party that refuses, over and over, to call much-needed health coverage “insurance” for Maine’s working poor, instead deriding it as “welfare” for people who should be perfectly capable of fending for themselves. But sometimes, as many Mainers with bigger hearts already know, life gets complicated for those with too many bills to pay and not enough money to pay them. Sometimes, hard as they might try, it’s all these folks can do just to keep their heads above water. Sometimes, Maine’s landscape is infinitely more complex than the one Republicans like to paint. To those who still refuse to accept that, just ask Jason Savage.